Set among 100 year old peppermint trees and stunning deciduous trees, our villas are situated high within the hillside to take advantage of endless views across the lake and surrounding countryside. Experience the attention to detail that guests have come to expect at Losari Retreat whilst enjoying massage and beauty treatments, in-house breakfast, chef-prepared in-house dinners and large private outdoor jacuzzi spas overlooking the lake. Explore the ancient limestone rock walls, trickling fountains, granite stone bridge over the waterway, and avenues and groves of assorted European and native trees. Discover the tranquility and peacefulness of the natural habitat with a walk through the adjoining National Park, visit the Margaret River township (an leisurely 8 minute drive away) or relax at the great wineries, restaurants and world class beaches. Featuring a king size Retreat bed, dual Raindance showers, extensive kitchen complete with Caesar Stone bench tops, dishwasher and cappuccino machine, eco fire place, leather lounges, 106 cm plasma screen TV, DVD, BBQ, day bed built into the deck next to the heated jacuzzi spa, peering out over the lake through the trees. Luxuriously appointed 2 bedroom, 1 bathroom self contained limestone villa. Fully equipped kitchen with cappuccino machine and reverse cycle air-conditioning. Features an entertainment area with leather lounges, 106 cm plasma screen TV, DVD & eco fire place. Large outdoor heated jacuzzi spa set within limestone walls, surrounded by Peppermint tree, contemporary gardens, and a large deck with BBQ and outdoor tables and chairs. Luxuriously appointed 2 bedroom, 1 bathroom self contained limestone villa. Fully equipped kitchen with Nespresso machine and reverse cycle air-conditioing. Features an entertainment area with leather lounges, 106 cm plasma screen TV, DVD & eco fire place. Contemporary gardens with grassed area and a large deck with BBQ and outdoor tables and chairs. With endless views across the lake, this limestone villa offers the finest facilities and privacy. King size Retreat bed, open Eco fire place, dual Raindance shower, reserve cycle air-conditioning. It features a large kitchen with cappuccino machine and freshly roasted coffee beans complete with leather lounges, 106 cm plasma screen TV and DVD. Opening out onto the decked entertainment area, the villa is equipped with a BBQ and heated jacuzzi spa overlooking the lake and surrounded by formal gardens. Fully temperature controlled air-conditioned. Stay four nights from Monday - Thursday excluding school and public holidays. Additional adults/children $50 per night in 2 bedroom villas only. 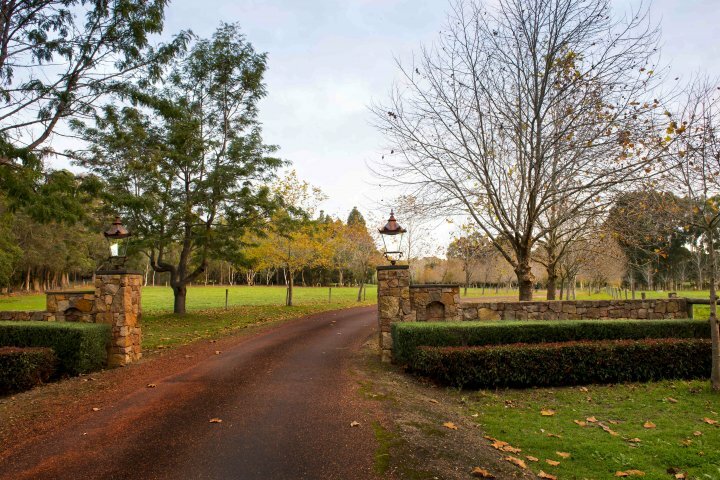 Losari Retreat is located at 498 Osmington Road 4kms north of Margaret River. Turn left off Bussell Highway into Osmington Road and continue for 5km. Turn right into the Losari Retreat driveway and follow signs to reception. If arriving later than 4pm, please ph 9757 3630 in advance, to advise of approx arrival time.